No two years are the same in Bordeaux but this one, with any luck, was unique. 2017 will no doubt be remembered as the year of the frost but it’s also a vintage in which many of the top châteaux produced some very good wines. It was, for sure, a year when location really mattered. As well as that, and beyond the spring frost, 2017 was an atypical, early growing season, with an early and successful flowering in late May, sunshine in June then heavy rain at the of the month, followed by a dry and cool summer, some late August heat, and then rather too many damp days just before the red harvest in September. It’s rare for the red harvest to be wrapped up for many estates by the end of September, especially for the later ripening Cabernet Sauvignon – as at Château Montrose in St-Estèphe above. Bizarrely, an unusual year all round has conjured up some classically proportioned red Bordeaux – and some excellent whites too, both dry and sweet. My feeling after tasting all the top wines from barrel was that this is a good to very good vintage for the reds – from those estates that weren’t hit by the frost – but by no means an exceptional one. 80% of the top 150 châteaux were not impacted by the frost as far as their Grand Vin, or first wine, is concerned, so for those collectors who have favourite wines from Pauillac, St-Julien and St-Estèphe, for example, they can, on the whole, buy with confidence. We could all argue the toss but my preferences are indicated by my scores. My top score, across the board, was 95-97, which I gave to seven reds and one dry white. All of these will, unsurprisingly, cost a small fortune as they come from some of Bordeaux’s greatest vineyards, and although there are some wines that score a little less for a lot less money, it’s hard to see, at this stage, where the values are going to come from in 2017. There appears to be some resistance at the châteaux to reduce prices by enough to make the campaign a successful one all round. Speaking of which, it’s useful to have an overall picture of the spring frost that caused so much damage, which is why I’ve put together a detailed map. After all, some Bordeaux buyers might want to look beyond the primeurs to the likely availability of bottled wines from across the region in the future. 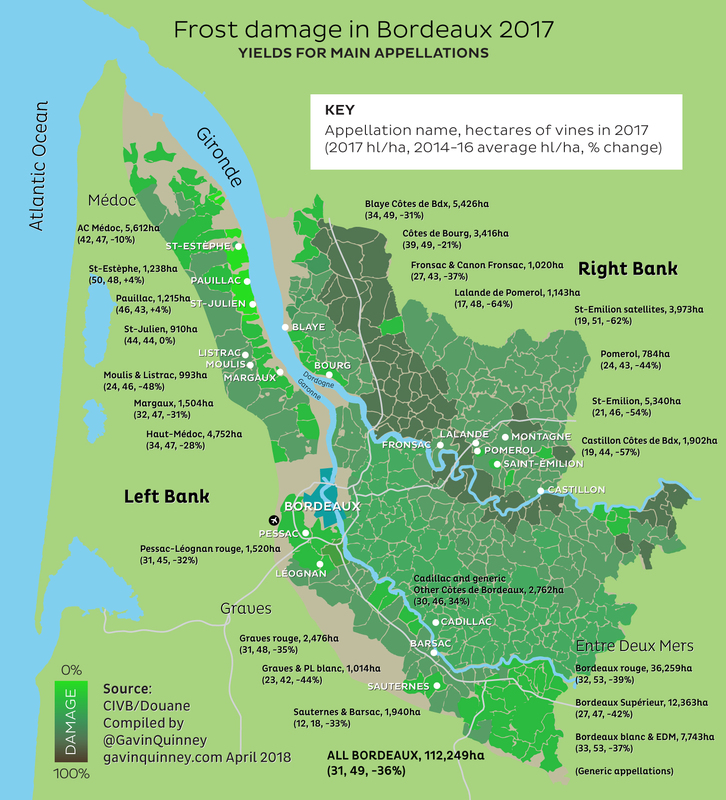 You can also see the stark contrast in fortunes (literally) between those in the northern Médoc appellations and their friends further south or on the right bank. It’s also worth considering some details behind the figures which can have such an impact on quality. Take Pomerol, for example. Of the 800 hectares there, 200 hectares (on the plateau, mostly) were unaffected by the frost, 300 lost 100%, and 300 lost around 50%. The work involved with the latter group was potentially immense, as in the picture below, as a team works to salvage what’s left from a frost damaged block – with important decisions about what actions to take, the skilled labour needed, the cost, yields and so on. And that’s before we get onto dealing with how to handle any second generation fruit. 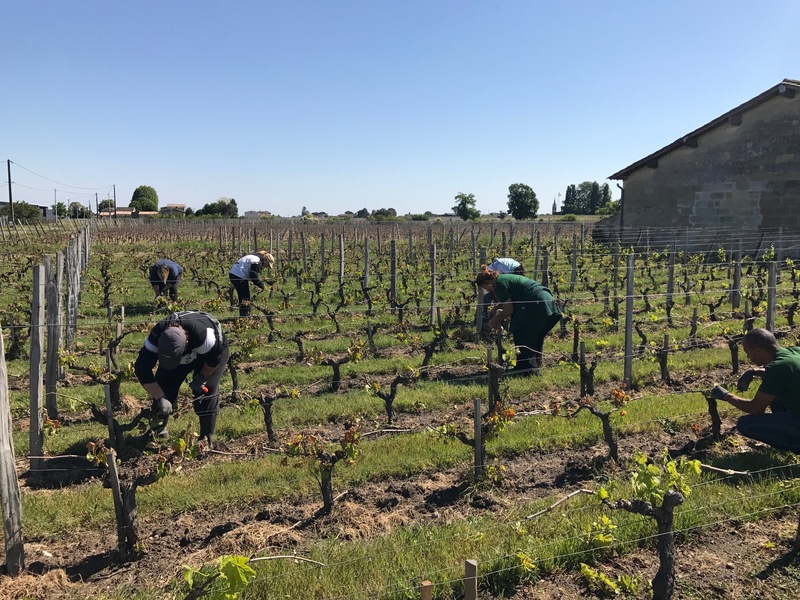 Of course Pomerol is a rather special case, and the tastings for the primeurs revealed that once again the top estates with the best located vineyards made exceptionally good wines. If yields were lower here, it was more to do with smaller berries than the frost. (16 of my top 100 wines from 2017 are from Pomerol.) Other properties close by, meanwhile, either couldn’t produce a wine at all or had to be incredibly selective. This was equally true just over the boundary in St-Emilion. Beyond the frost, it was an early growing season that was quite different to the other two early seasons this century, 2003 and 2011. The precocious, successful flowering in late May in 2017 was followed by a hot and sunny June and then really heavy showers at the end of the month. This was a crucial time as hydric stress at this point stops the vegetative growth and encourages the vine to focus on fruit production; then a relatively cool and cloudy July didn’t exactly push things along. August though was hot at the start and the finish, and both months were pretty dry – and the cool summer nights were good for the vines. Rain at the start of September was therefore quite welcome to freshen up the vines just before the red harvest but the rain continued, on and off, until the 16th September. It was also getting chillier, dampening the spirits somewhat. 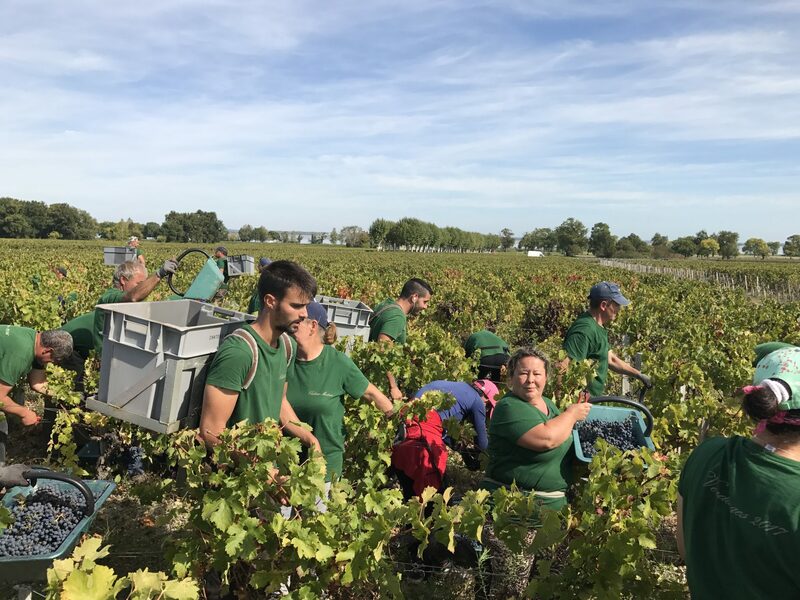 Fortunately, sunny and dry weather returned for the harvest of most of the red grapes in the latter part of September and the first days of October. So we have what are now being referred to as ‘classic’ red wines, but from a rather un-classic season. 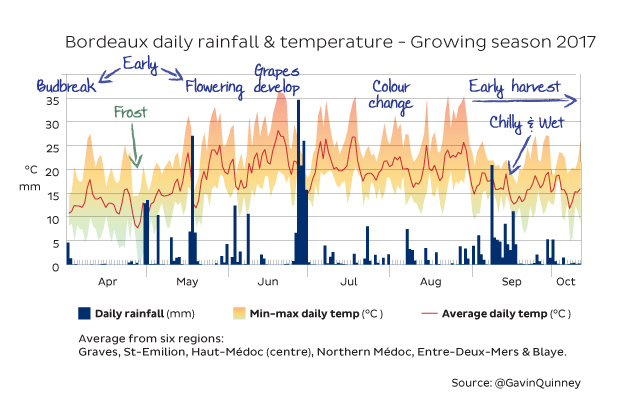 As Aurélien Valance, the Deputy MD of Château Margaux, pointed out, ‘flowering was 10 days earlier than normal but the harvest dates were within the average’. 2017 was a dry year, taking into account the 12-month cycle with 700mm of rain v the 30-year average of 900mm. However, if you take just the growing season from March to September, the rainfall of 470mm was almost identical to the 30 year-average. Here is a Bordeaux 2017 en primeur buyer’s guide. The correct answer is probably ‘none’ but, qualitatively, a hypothetical blend of 2014, 2012 and 2001 – with a dash of 2008 and 2006 – isn’t way off the mark. So we are not putting 2017 in the same bracket as the leading vintages of 2000, 2005, 2009, 2010, 2015 and 2016. For most of the leading estates, however, a bottle of ‘17 at the end of a line-up of 2014, 2015 and 2016 would not seem out of place. Indeed, some of those winemakers on the plâteau in Pomerol, above, refer to ‘17 as the last of a triumvirate of three excellent vintages there (‘15, ‘16, ‘17). I can also see why a number of châteaux in the northern Médoc say they actually prefer 2017 to their 2015s. 2015 wasn’t wholly successful there, thanks in part to a little too much September rain. Not wines of extraordinary dimensions but they have lovely fruit, good texture and length, fine tannins, moderate alcohol, and good acidity.